These are the most important special Tools you will need to make to build a Britshock BSA Otter. "Britshock" and "Otter" Tools. Used in there manufacture. For some time I have been asked to explain some of the tools I have had to make to build the "Otter's" I have put together. And to explain the function of the frame jig that I constructed. This week I was asked again to explain the tool that I made to Swage the BSA Bantam headstock to reduce it to size to be able to fit the available 47mm tapered bearings. So this is the tool we will start with. The parts for this ,took me about three hours one afternoon to make,and complete the swaging of the headstock. The parts were turned out of steel stock from the bin. The top female swage was actually two parts ? 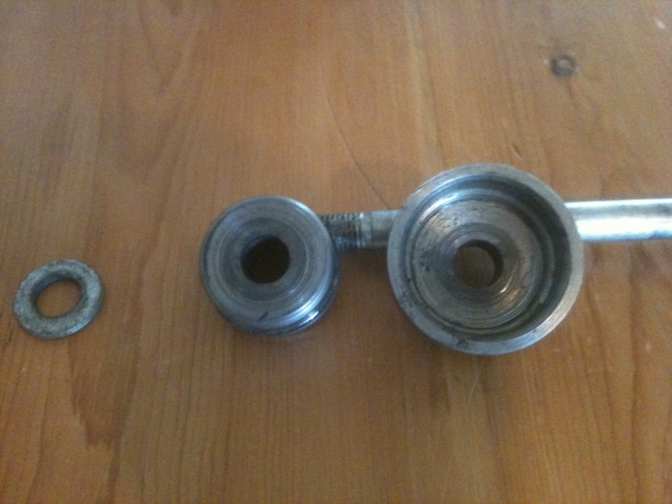 top pressure plug was 50mm solid round-bar the female tube was 2 1/4" thick-wall tube. This was machined on the internal face to just under the size of the outside of the BSA Bantam headstock,with a smooth taper entry to start onto this. The bottom male swage was also machined out of 50 mm solid bar, with has you can see a rounded lead for starting. Size? 46mm. The bolt used was a 250 mm X 16 mm HT . OK . Self explanatory really how it works ? Bolt the two parts through the steering head with the male swage sitting inside the original track. Pull the female swage over the other carrier, and this will take quite a bit of pressure, that's why you need a good bolt. Repeat the process on the other end. this time the Male part also has a job by opening out the swagged end to the 46 +mm for the New bearing. Yes you have to repeat this ,to open out the second entry. Use plenty of grease for this operation,or the parts will bite. Now press in the bearings. Summing up You could use an hydraulic press for the operation if you have one? but by doing the operation using the bolt there is no impact that you can't repair? This is probably one of the most important tools in your chest?Good joints mean an oil tight motor. You really need to make sure the surfaces on the engine covers are good. I do mine on a surface table with a large sheet of linisher belting laid onto it. A gentle pressure onto the case being surfaced and a figure of eight movement for about a count of one hundred passes seems to do the trick. However if there are deep wounds you need to keep going with the action until you have a perfect pit free surface on the joints. Work now save leaks later is the philosophy. 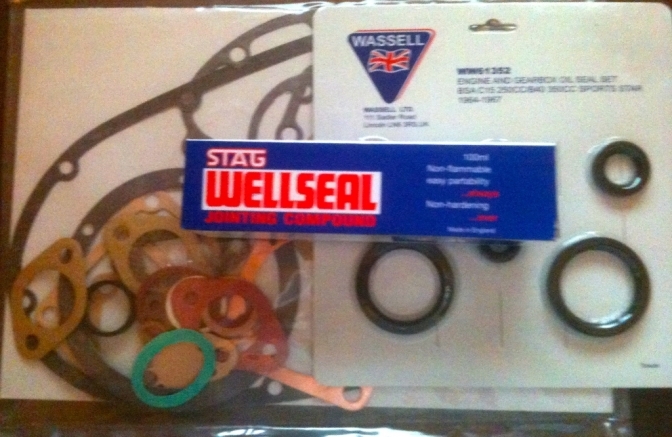 I used Wellseal way back, doing my apprenticeship on Fordson tractors. and still reckon it is the best jointing compound you can use? It never sets and stays flexible. Triumph/BSA Four-stud fork damper rod removal tool. This two foot long tee handled rod, is what you need to hold the inside slot on the damper assembly while you loosen the Allen screw that retains the damper unit to the fork slider. The end needs to be a fraction under half an inch wide (11 mm about) to be able to fit into the depression in the damper top, the spade for the slot needs to be about a quarter inch in depth. I Just turned up the end section on the lathe and drilled the hole for the handle as well on this, then hand filed the spade on the end ,before welding the rod into place. This tool is a must if you have forks that have not been apart for a while and may have rust formed around the thread. OK These are a few simple tools that will aid you if you are anticipating building your own frame or even setting one up for any modifications ETC. The Angle finder gauges are only cheap but being magnetic are so handy to determine any angle that you may need or be contemplating using. 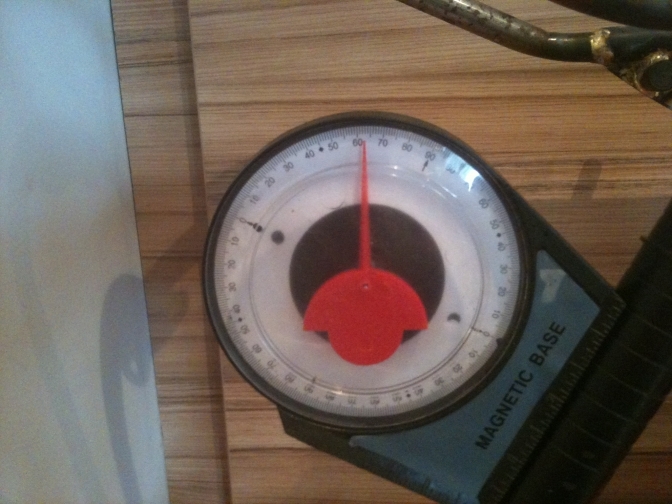 A little magnetic spirit level is also a God-send to get a frame set up right for a lot of operations. A steel rule, and G clamps always come in handy. 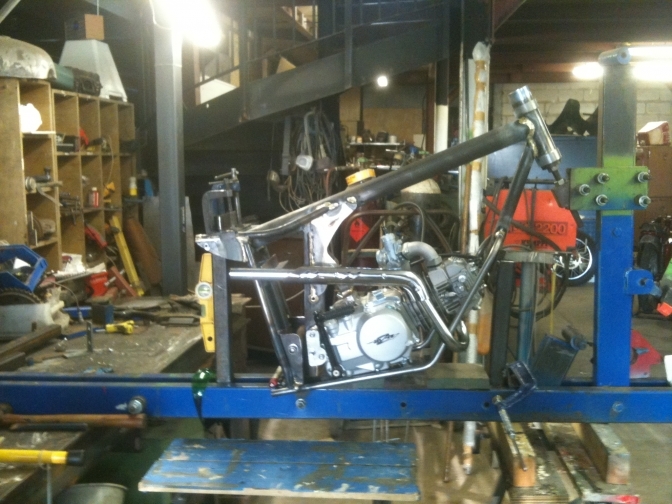 Then we come to the most important tool if you are contemplating building a frame from scratch or even modifying one. This is my Universal frame jig. 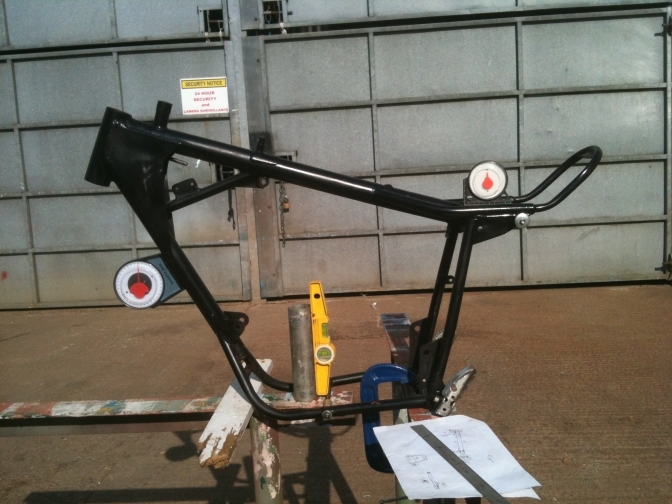 Not have I only built Trials motorcycle frames on this jig , but I have also built a couple of cycle frames on it as well. You also need a robust true flat surface as well, like a good steel bench or even one made out of kitchen work top will suffice. 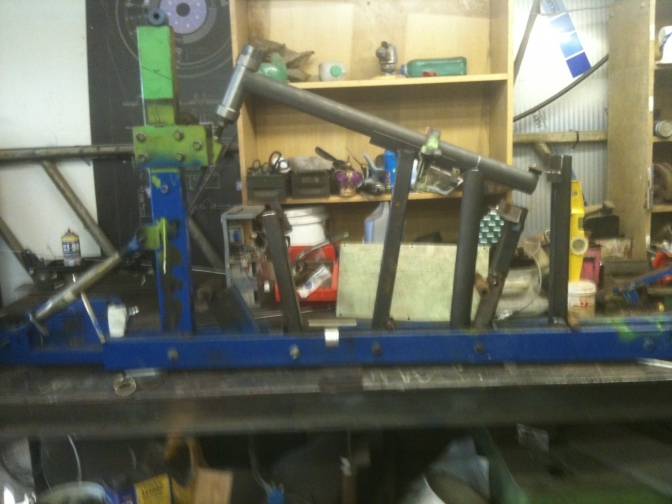 As you can see from the photos,this jig is fully adjustable, with the steering head post being able to be moved from the upright to accommodate longer and larger frames. and any new positioning bracket can be made and then clamped or bolted between the two large base plate tubes. Oh, and time for a beer when a good job is done. Then probably the best thing I ever made. 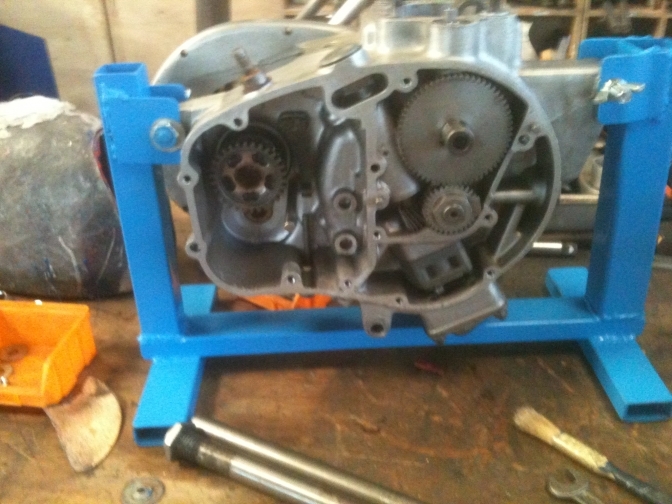 Just a simple frame to hold an engine in rebuild on the workbench. It does not have to be that perfect and the bolt holes don't have to be perfectly correct as long has you can get the couple of bolts to fit through the engine bolt holes to hold the engine secure in the frame. Jobs on the engine are just made more easy and accurate, if the engine is not moving about all of the time. I found this little video a while ago and if you are contemplating using square section tube on a build this proves you don't have to spend a fortune having the tube bent. This is 1" tube but you could go up to 1 1/2" if you were strong enough. The secret to bending square section tube is if you look closely at the video you can see on the round former there is a strip of round rod around the centre of this this can be 5/16" or 3/8" in diameter. What this rod does is to force the top surface (Inside) of the steel tube inwards to allow the pinched metal to find a new position this will show up as a dip in the finished bend, but keep its strength because of the new shape formed, the same will happen on the outside stretched surface but the dip will not be as deep. 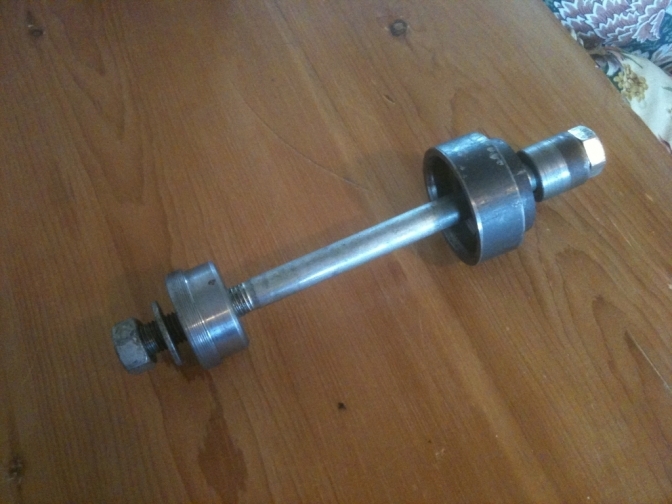 Coming soon making a set of rollers to bend Square tube too. This is Mate Paul Ellis boring one of the BSA C15 barrels on our "Olde Lathe" "Big-Bess" to except the 69 mm Triumph piston. Paul is not only a brilliant engineer but he is also one of the UK's best "Silversmith's. 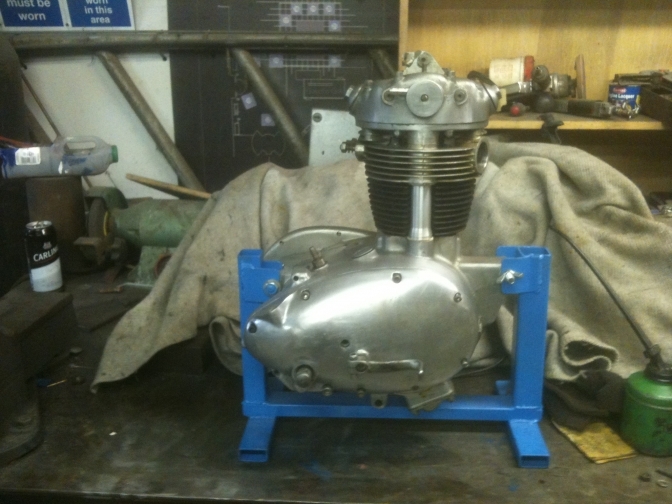 and more ideas for itims that can help with your bike and engine builds. I always use an angle finder to set the angle of the rear suspension units before I weld on the mounts, because as you know altering the slope of these units does make a lot of difference to how the bike feels and performs, and it is not just spring weight and load. 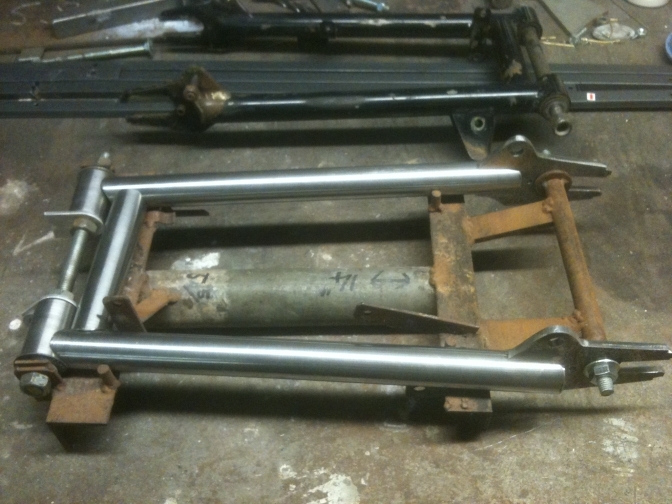 A Simple jig made to hold parts in the correct position while welding is essential, as this swinging arm jig made by the late Harry Foster shows. I did not believe it would work when I first saw it, but every part was held in the correct position even down to the side stand spring retaining pole.